First off, just some quick housekeeping. With the quasi-holiday on Monday, I am shaving an hour off the end of the pickup so it’ll be 4-6pm. If you can’t make it until after 6, no problem – just let me know and I will bag it up for you. My apologies that you’ve heard a lot of complaints from me lately. Fortunately you’ve caught me in a good mood today! I get rejuvenated via really delicious, fresh food and I’ve had some amazing food this week. Thursday started out with scrambled eggs, broccoli leaves, scallions, and savory for breakfast. 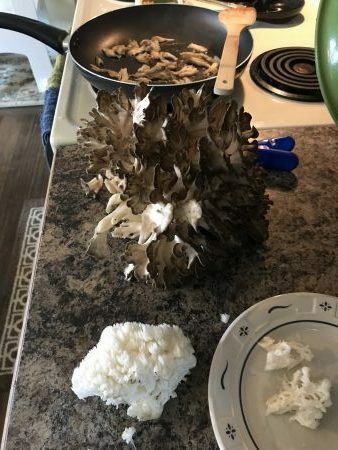 Snack was some foraged autumn olives and lunch was supplemented with the 3 pound hen of the woods mushroom Pat and I found on a little foraging walk we took through the woods. If we can find another gem like the one below, I will put it on the list this week or next. It’s so good I want to horde it all for myself and share it with you all because I want you to experience its deliciousness. Apparently it was a really productive foraging adventure, so Pat says I shouldn’t get used to it. To boot, Pat and I knocked a few things off the to-do list that have been there far too long. 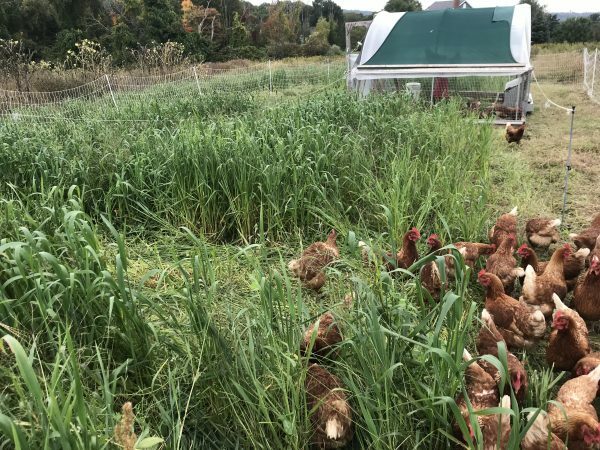 Like finally moving the hens down to next year’s garden location in a gorgeous patch of oats and peas to forage on! Better late than never I guess. 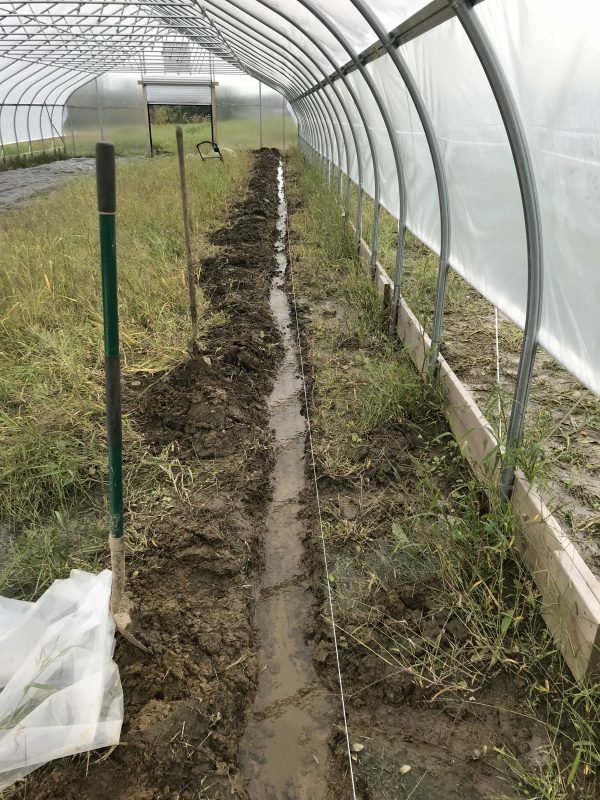 And digging this ditch in the high tunnel…which is a bit of a ridiculous concept since the whole idea behind a tunnel is to mitigate mother nature’s mood swings. What was left out of that equation is that we’re on a slope so all that water above was just running down the saturated pasture and right through where I was hoping to plant. We dug that ditch on Thursday morning and by Friday evening, water was still running the length of the tunnel and out the far end (not a long-term solution – any environmental engineers out there!?) even though it hasn’t rained since Tuesday. If it ever dries out, I have over a thousand seedlings ready to go in the ground that could feed us for the next couple months! I’m hoping this does the trick because the window for planting is closing fast. Some may say it closed a month ago! Put your veggie orders in online before 6am Monday. We’ll have your order available for you to pick-up from 4-6pm Monday on the farm at 64 Potter Hill Rd in Grafton. Pickups are in the long white garage on the left across from the big red barn at the crest of the hill.